Why are our steaks so good? Well, we are rather fussy about our meat at BB. We all love a good steak, and like you, we all have different criteria for what makes it good. For some our prime pick is a well-seasoned and juicy sirloin, cooked medium-rare, served with béarnaise sauce. For others a classic fillet, rare and tender, is the way to go. There are, however, a few things we all agree on. We want delicious, well-aged, premium beef from well looked after herds. We want them to be raised in a ‘clean green’ way, and with minimal stress. We want to know where it comes from and how it got to us, so that when it gets to our plate we can simply enjoy. That’s where Aubrey Allen come in. We are pleased to say we have a long-term relationship with this fantastic supplier who deliver everything we want, and more. Environment and welfare is paramount to them, not only for ethical reasons, although these are high on our list, but because these factors have the greatest influence on eating quality. Our beef is all from their Irish Heritage cattle. Tthese happy herds are allowed to develop slowly and mature naturally in huge, clean pastures, fed by pure spring water, far from industry and pollution. 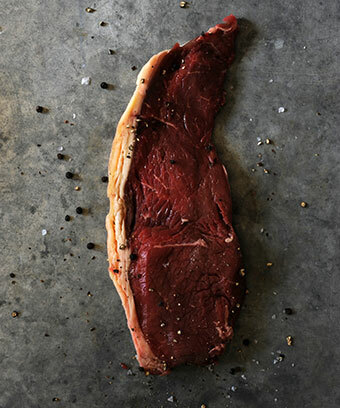 We have full traceability and all of our steaks are expertly dry-aged for 30 days to naturally intensify the flavour.With this amount of care and diligence going into all of our meat before we even cook it, we think that’s why our steaks are so good.